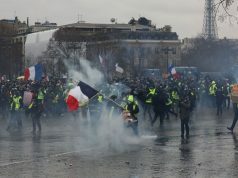 As anti-government demonstrations turned violent on Saturday, December 8, French police met protestors with tear gas, detaining nearly 300 Yellow Vests in central Paris. 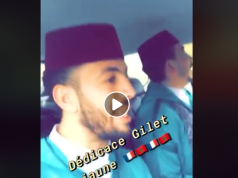 Rabat – The Yellow Vest protestors, whose anti-Macron demonstrations have reached an unprecedented scale of violence, have taken French authorities by surprise. 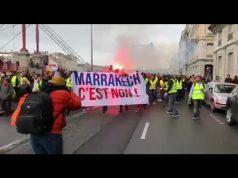 The yellow vests are denouncing President Macron’s apparently pro-rich policies and the high cost of living. 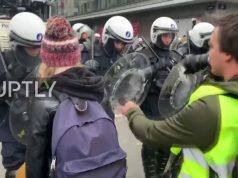 Using tear gas for the first time on the protesters, French police managed earlier today to restore relative order in Central Paris, according to France24. “We have already detained 481 people in Paris, of whom 211 people have been placed under arrest,” France’s Prime Minister Edouard Philippe said. Fearing that the riots would turn more violent on the third weekend of the Yellow Vest protests, police fired tear gas shots, the newspaper explained. French authorities decided to close major monuments and sites in the city including the Eiffel Tower, Louvre and Orsay Museums, Grand Palais, and opera houses. Music shows were also cancelled. Thousands of “Yellow Vests” named after the high-visibility jackets worn by French drivers, started street protests November 17 in Paris, due to an unpopular tax on fuel proposed in France’s national budget. 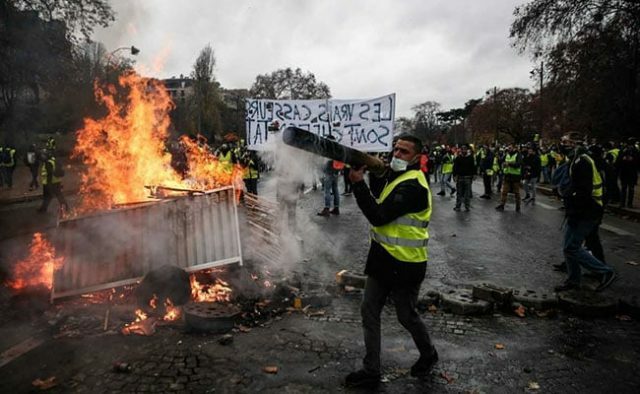 The increasing violence initiated by the Yellow Vests pushed government officials to suspend the fuel tax proposal. About 8,000 police officers are on duty in Paris to avoid the break out of more violence. On Friday protesters proceeded to set vehicles on fire during late night riots. Last Saturday, protesters looted shops, smashed cars, and defaced Triomphe monument with graffiti. Four people have died since the beginning of the protests. 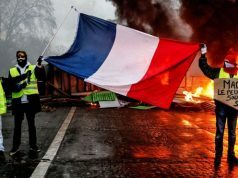 Claiming to have been spurred by Macron’s “arrogance” and contempt for poor and low-income France, protesters said they are willing to spend Christmas and the New Year calling for Macron to step down as president. “I’m prepared to spend Christmas protesting at this roundabout with my children – we won’t back down and we’ve got nothing to lose,” the Guardian quoted a 41-year old protester as saying. “He gave good speeches and I really believed his promises that he would change France. 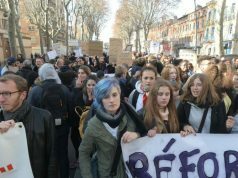 But not any more,” the protestor continued, hinting at the general mood of disappointment and despair among the majority of poor-income French people. According to recent opinion poll, Macron’s perceived pro-rich policies have made him outright unpopular with the French people. Even former pro-Macron voters have expressed dissatisfaction, claiming that the president has betrayed the values and policies he appeared to espouse during his presidential campaign. Only 18% of French now favor Macron, according to the opinion poll.